Ride FREE with your Concessionary Travel Pass or pay a fare if you haven’t got a pass. Dial–A-Bus is a door to door bus service for all the community, including the young and elderly, specially designed for people who cannot use conventional buses and for communities with infrequent public transport. 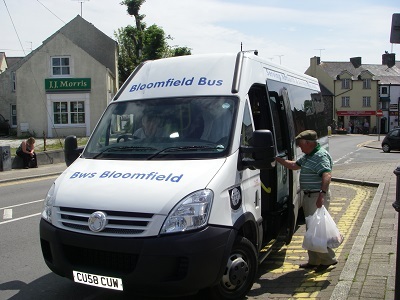 You book your ride, the bus comes to your door, and takes you to wherever you want to go in the Narberth area. The Dial-a-Bus is specially equipped to help you if you can’t manage the steps, or if you use a wheelchair, you can use the lift to help you get on and off easily. The driver will give you every possible assistance, and they won’t hurry you either. by 12 noon on the day before you wish to travel.